The most successful brands on social do several things right, or rather differently. Everyone who succeeds traces their unique path. But they all have one thing in common—they are memorable. The reasons vary. Some have an arresting sense of humor, others provide exemplary customer service, while some post impressive content. ‘Memorable’ means different things to different people. But a business can’t hope to be at the top of their target audience’s brand recall unless they have created something distinct in this space. 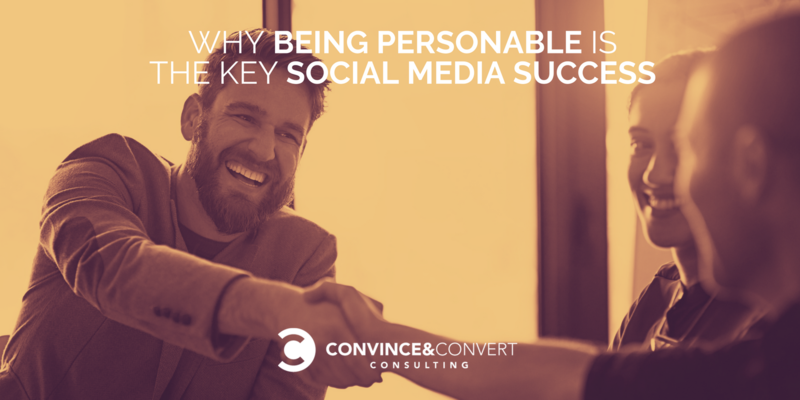 Typically, the winning brands are personable and relatable. They ooze personality. And they don’t shy away from speaking their mind. How does all this come together to create an impressive social presence? Here are some observations to get you started. Your personality is your X factor. There is always a fear of a brand’s voice drowning out in the din and cacophony of social media. Not only is the competition fierce, these platforms are a fast-moving space. Tweets are easy to miss, and Facebook updates vie for attention with posts from family and friends, whose statuses are intrinsically more interesting to users. How do you make your presence felt? By giving your brand a distinct voice. How do you stand out? By daring to let your personality shine. Whether you want to be quirky, shocking, unconventional, or just plain friendly, the choice is yours. Just don’t be boring. That’s the quickest way to be forgotten, or not even being noticed in the first place. Choosing a voice for the brand will take considerable thought. You want to be true to the essence of the business, as well as to where you want to go with it, and you want to be consistent in the tenor. Once you have decided on the mood and tone of the social media updates, it will be time to nurture the voice, which is also a matter of trial and error. But you will create a distinct persona sooner than you suspect. This voice will also infuse all your content. Doing so will have other benefits, too. You attract the right audience when you are authentic about your values. Remember, “Your vibe attracts your tribe.” It’s better to have a few thousand loyal followers than many indifferent ones. Those who believe in you will spread the word on your behalf. When people love a brand (and a brand’s personality is a big part of this), they become brand advocates. 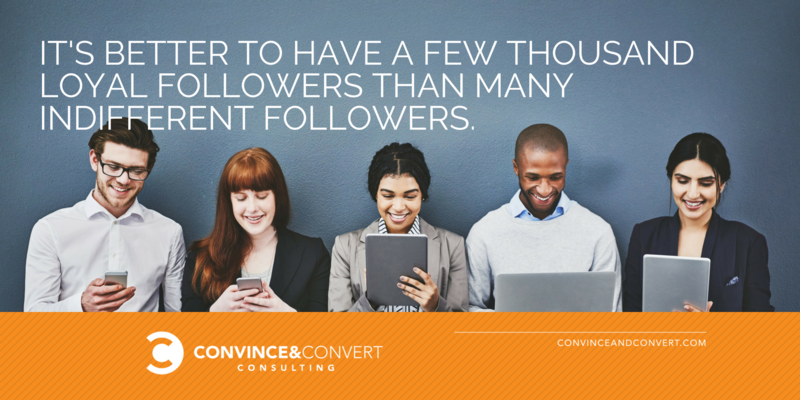 Your content speaks to the followers. When you have a voice and are attracting people who share the same ethos, it’s only time they will start to celebrate the content. Why do some businesses have binge-worthy blogs and others have ‘MEH’ written all over them? Why do we subscribe to certain YouTube channels and not others? Because their content speaks to us. They are, of course, not individually addressing us. But we feel as if we are a part of a clique or a family. Even though you send the same content out to all your followers, it has a different impact on everyone who consumes it. Ever felt “This is just what I was thinking!” when a video update landed in your notification bar? You are not alone. When we are a part of the right kind of tribe, it almost feels as if the brands we follow can read our minds and give us exactly what we were wondering about. These brands have done their research well. They have cultivated an authentic voice. They have attracted the right kind of followers who look forward to their content. They post at the right time (more on this later). They interact with their followers and know what the community feels and wants (there are tools that help with this). Timely content that makes followers drop what they are doing and click on the notification does not just happen. A lot of planning and demanding work go into it. But the personality and the voice of the brand (an individual or a business) are the driving factors. Behind the scenes, these businesses have apt tools and sound websites to pull off this synchronization. Smart use of technology can create magic. Your content has the wow factor, it is hugely relevant, but you also need to make sure it is reaching the right kind of people at the right time. Analytics is a big part of this. 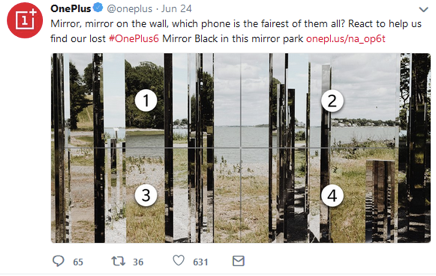 Marketers are not mind-readers. But with the right tools, they can well be! When are your precious followers most likely to spot your updates in their feeds? If you have a global following, you need to be mindful of the time differences. With a social media management tool like Zoho Social, you can learn of the best time to post (as well as what to post) across channels and time zones. This space is rife with fantastic software and is worth exploring in detail. Most schedule optimization tools—Tweriod and Followerwonk are two great examples—require running reports and checking results to see when your followers are generally active online. 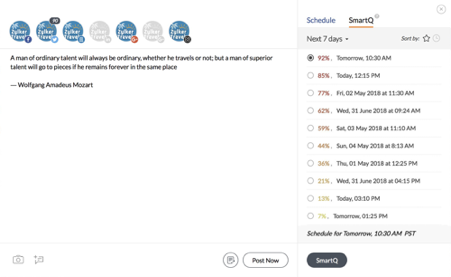 Zoho Social’s dynamically updated SmartQ feature goes one step further to access empirical data and suggest the time slots that have recently yielded the most engagement on your posts. But businesses often falter due to a lack of the right tools and technology. Is your website robust enough? Is it easy to navigate? Are all the links working fine? Can it handle heavy traffic if a webinar of yours is a huge hit? Ultimately, this is where people will land from your social platforms if they want to sign up for a plan or make a purchase order. For small businesses, it is very important to have this part of their business in top shape. Find a solid and reliable web hosting company for your business. Reliable technology, as much as a smart strategy, is crucial for creating magic on digital. Live webcasts and videos draw an audience in. The audio-visual medium is powerful. That is not to say the written word isn’t. Your approach should include both. Both videos and live streams can cement a brand’s personality. For people to see the faces behind their cherished brand, to hear them talk, laugh, and express an entire gamut of emotions, is relatable. This is the kind of stuff that draws people in and makes them return to your channels. Live webcasts are interactive and build instant engagement. Even if you start out small, keep the chats engaging and give out your expertise freely. When you are courageous and big-hearted on social, you will see your following increase. B2B companies can upload videos to LinkedIn if that is where you feel most of your target audience resides. The bottom line is, a well-made video will work on any social platform. To create a mark on social you have to give the followers something extra while also making them feel special. Technology, intuition, creativity, and courage: they all play a role in it. There are no hard and fast rules here, only the realization that you are ultimately talking to humans who have had enough of content in their feeds and are feeling jaded with it all. How can you make them perk up? How can you get them to listen to you and your brand? What do you have that they cannot turn away from? Put yourself in their shoes; you might know where to start.